Do You Need Insurance for a Commercial Stair Lift? Do you need insurance for a commercial stair lift? This is an important question to ask before installing one at your business. It is imperative that your business has the correct liability insurance that covers personal injuries suffered by employees or visitors who use commercial stair lifts. Most states require companies to hold liability insurance to protect them from claims, which covers the stair lift owner and installer. Indy Stair Lifts, a division of Nationwide Lifts, is proud to offer a variety of commercial stair lifts designed to provide maximum durability and stand up to repetitive use in all work environments. Our commercial stair lifts provide safe and easy access to most levels of a public building and are built with high quality components that exceed national standards and are covered by comprehensive warranties. Your commercial building must be accessible to everyone and stairs, from front steps to interior stairways, should not be an obstruction to employees, clients, customers or patients. We offer the Indy Pro model stair lift in compact, extra-large and outdoor models to suit your needs. If space inside your building is limited, check out the Indy Pinnacle or Indy Lux models. These compact designs are ideal for narrow staircases and support various body types. 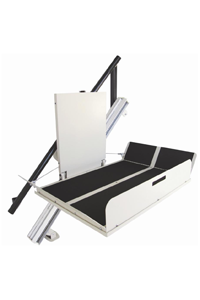 We also offer an XL stair lift with a 500 pound capacity. If your building has other obstacles, including outdoor steps or curved stairways, our Outdoor and Curved models are ideal. Our Outdoor model withstands all weather conditions and allows individuals to enter your facility regardless of weather. Our Curve model is customized to the twists and turns of your stair case. Contact your insurance company for details on liability insurance that covers your commercial stair lift and call Indy Stair Lifts at 888-203-5754 for information on stair lifts models that are ideal for your commercial business needs.